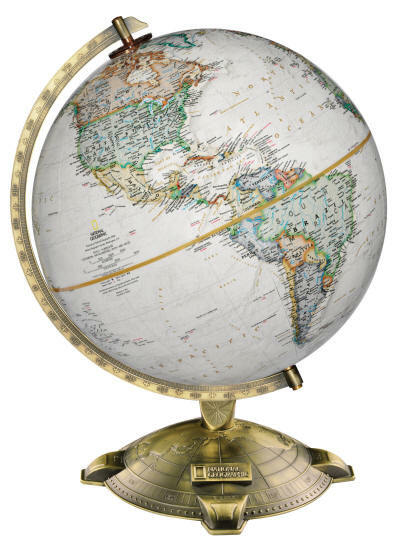 The Allanson world globe features a unique metal base with a die-cast map of the northern hemisphere as well as an official National Geographic logo. The 12" diameter globe, shows the latest National Geographic maps in parchment colored cartography. It is held by a die-cast numbered semi-meridian. Thousands of place names include continents, countries, capitals, biggest/important cities, bodies of water and much more. Features raised relief cartography, to better emphasize the mountainous areas of the world. Time dial is located at the North Pole.